Heddels and PF Flyers' Mercury All American sneakers are inspired by NASA's original astronaut boots. You can now take a walk in NASA's original astronaut shoes, or at least a pair inspired by them, if you are among the very lucky few. Heddels, an online resource for well-made clothing, has announced the "Mercury All American," a sneaker made with the athletic shoe brand PF Flyers. The limited-edition footwear honors PF's role in Project Mercury, the United States' first human spaceflight program, which was established 60 years ago. B.F. Goodrich produced the silvery spacesuits worn by the Mercury astronauts. PF Flyers, B.F.'s footwear brand, made military athletic shoes of the same style worn by the likes of Alan Shepard and John Glenn as they prepared for their missions. Heddels and PF Flyers' Mercury All American blends the two divisions' legacies by incorporating the spec materials used by B.F Goodrich into a silhouette similar to that of the shoes worn by Mercury astronauts in training. The $380 Mercury All American is limited to just 21 pairs — the same number of spacesuits that B.F. Goodrich delivered to NASA. Heddels is running a free raffle through Sunday (Feb. 11) for the opportunity to purchase the shoes. NASA's original Mercury astronauts in B.F. Goodrich silvery spacesuits. From the left: Wally Schirra, Alan Shepard, Deke Slayton, Gus Grissom, John Glenn, Gordon Cooper and Scott Carpenter. "The concept was to make a shoe that was a microcosm of Project Mercury itself," explained Shuck, "incorporating as many materials and designs from the original program as possible." The high-top sneaker features an aluminized nylon Nomex upper, a high-visibility orange lining, a heel pull-tab, nickel-alloy eyelets and paracord laces. "I felt the key to this whole thing was giving the shoes the look and feel of a piece of the spacesuit. The suit itself was made of a heat resistant aluminized nylon. The most heat resistant nylon material available at the time was Nomex," wrote Shuck. The silvery material is more than just shiny. Like the spacesuits, the shoes' twill can withstand heat upwards of 3,000 degrees Fahrenheit (1,650 degrees Celsius). The orange liner material was inspired by the pressure garments' brightly colored satin interior used to help recovery crews spot the astronauts after splashdown. The Mercury boots had olive nylon straps and webbing, which Heddels replicated in the heel tape and loop. The nickel alloy eyelets, through which the parachute cord laces are threaded, are a nod to the Rene 41 alloy shingles that covered the Mercury space capsule. The Mercury All American even has its own take on NASA's emblem, a red and blue "P.F. Flyers" patch reminiscent of the space agency's insignia. Heddels and PF Flyers' Mercury All American sneakers are made from aluminized nylon, nickel alloy and parachute cord, among other materials original to the Mercury spacesuits and capsule. The price of producing the Mercury All American out of all authentic materials was that the shoe was destined to be a limited edition only. 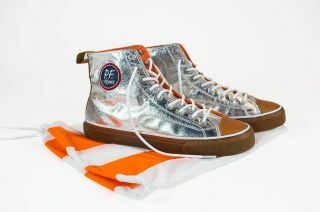 "In conceiving this project, both PF Flyers and I imagined a large production run of shoes," wrote Shuck. "But as the details came in and we became enamored with the Nomex material, the retail cost began to rise." "Materials designed to be blasted into space are generally quite expensive, even if they are 60 years old," he noted. Heddels will conduct a random drawing of 21 raffle entries on Monday (Feb. 12) to choose who is eligible to purchase the Mercury All American. Because of the small production run, Shuck said they were able to customize the packaging for the shoes. "We considered boxes that looked like the portable air conditioners the astronauts carried with them to the launch pad, until we saw these images of wooden NASA shipping crates," he wrote. "And then learned you can ship wooden boxes through the mail." The Mercury All American will be packaged in a parachute-inspired ripstop nylon drawstring shoe bag and shipped inside a screw-secured wooden shipping crate. Accompanying the shoes will be a brochure about the shoes in the same style as NASA's 1970s informational pamphlets. Heddels and PF Flyers are not the first to draw inspiration from space exploration for shoes. In 2015, Adidas offered trainers based on the look and feel of NASA's spacesuits. A year earlier, General Electric and JackThreads produced an Apollo moon boot-inspired limited-edition sneaker. Nike has also looked to space for its footwear, including a Mission Control-themed set in 2013, a sneaker styled after the space shuttle pressure suit in 2012 and a Buzz Aldrin-endorsed pair celebrating the first moon landing in 2010. See more photos of Heddels and PF Flyers' Mercury All American shoes at collectSPACE.